In this world of smart technology everyone believes in online world where you get things fast and easily available. Unlimited advantages of this online procedure attract million of people around the world. The mobile phones which have become the need and necessity of our life and is used on daily basis needs to be recharged for calling and internet services. Earlier we use to walk to the shops to the retailers for getting our recharge done but these day’s online stores and number of applications let you get easy mobile recharge. 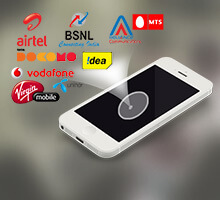 Stores like paytm, Freecharge, Mobikwik, Recharge adda and others gives you easy recharge options of networks like Vodafone, Idea, Airtel, Aircel, BSNL, Tata Docomo, and Tata Indicom. You will get options of easy mobile recharge from your mobile application just sitting at your home. No more standing in queues, no more wait to rush to market and no more worries to know about current cheap plans on your network. Further the discounts offered by these stores on your recharges let you enjoy your plans at lower cost. Now, pay your bills, recharge for your friends and enjoy great offers every time you open the Aircel App. Just download it and step into a world of great convenience. Also get exclusive recharge offers and best deals according to your usage. Visit the store and get The Aircel SIM Dongle now at just Rs.295. No coupon code needed. Hurry to avail this offer to enjoy the deal. Recharge now and get flat Rs.15 cashback on Jio recharge amount above Rs.300. Coupon code can be used only once per user/number. To avail this offer use the coupon code at final payment. Enjoy the deal before it ends. Recharge with Rs.199 and get unlimited calling & 1.5 GB/day 4G data for 28 days. Enjoy originals like Karenjit Kaur, latest movies and trending TV shows on Zee 5. Visit the store and get 1 GB data free when you download the Aircel App. Offer is valid on postpaid subscribers. Get 500 MB data per month for two months. Hurry to avail this offer. Airtel is giving a special offer to prepaid users. Enjoy unlimited calling and 1.4 GB/day at just Rs.448. Offer is valid for 82 days. Recharge now and get 56GB 4G data and free calling on recharge of Rs.309 only for 56 days. Offer is valid for only Jio Prime Prepaid Users. Get flat Rs.50 cashback when you recharge minimum Rs.300 or more. Grab the coupon code at final payment. Offer is valid for JIO recharges only. Check out the promo page for more details. Paytm offers you "Kaun Banega Lakhpati". Get a chance to win Rs.1 lakh cashback when you recharge and pay bill on Paytm. Use the coupon code to redeem this offer. Only 2 lucky winners will be awarded 1 lakh rupees each every week. Offer is valid for limited period. Check the offer page for more details. Now avail up to 500% cashback on recharges & bill payments and save the money. Minimum transaction of Rs.30 is required. Maximum cashback Rs. 150 can be availed. Enter the given promo code at final payment. Offer is valid for New Users only. Cashback will be credited within 24 hours after the successful transaction. Transact online and get 100% cashback on first recharge & bill payment. Grab the given promo code to redeem this offer. No minimum transaction amount is required. Coupon code is applicable for new users only. Offer is valid on FreeCharge App, Web, and mWeb. Aircel is giving you free phone offer. Buy Lava Captain N1 only at Rs.850, use it with Aircel SIM for 24 months, and get the money back without having to return the phone. Offer is valid for prepaid Aircel Subscribers. Hurry to book now. Recharge now and get full talk time and extra benefits at Rs.108. No coupon code required to avail this offer. Hurry to avail this offer. Pay online and get cashback when you pay Rs.200 or above using the Bharat QR Code. No coupon code is required to avail this offer. Hurry to save the money. Buy JioFi now and get unlimited voice and data worth Rs.1,999. Get 4G data and HD voice even on 2G/3G smartphones. Connect up to 10 devices. An EMI starts from Rs.95.03. EMI is applicable on Credit Card only. Enjoy fast internet. Aircel is also giving you Missed Call Alerts service on your number. Get instant SMS alerts every time, you miss a call. Dial *999*1# to enjoy this service. Now get 10% cashback on recharges and bills. Coupon code is also available to avail this offer. Maximum cashback of Rs.10 each on 1st & 3rd transaction cab be availed. Offer is valid for all users. No cashback will be given on the second transaction. Enjoy the deal. Visit the store and get Aircel Pocket Internet on Prepaid Cards. Choose from our new range of PocketInternet cards as per your need. Check out the offer page for more details. Now get the new SIM delivered to your favorite place and enjoy the deal. Get a pre-paid plan for everyone. Recharge now and get unlimited calls. Also get 2GB 4g data per day for 90 days. Offer is valid for Jio Users. Don't miss this offer. Grab the deal before it ends. Transact now and save up to Rs.75 cashback. No minimum transaction amount is required. Enter the given promo code at final payment. Valid only Once per New User/Credit/Debit Card/Mobile Number. Offer is valid on FreeCharge App, Web & mWeb. Visit the store and get 100% cashback on your first recharge & bill payment. To enjoy the deal use the given promo code at final payment. Offer is valid for a limited period. Coupon code can be used once per user. Install My Airtel App and enjoy Netflix for three months. No coupon code needed. For more details, please check out the promo page. Get Rs.200 cashback on your first recharge and bill payment. To avail this offer apply the given coupon code at final payment. Offer is valid on minimum transaction of Rs.20. Enjoy the deal before it ends. Buy Lava Caption N1 Only at Rs.850, use it with Aircel SIM for 24 months, and get the money back, without having to return the phone. Offer is applicable to Prepaid Aircel Subscribers. Please visit the offer page for more details. Don't miss this deal. Spend minimum Rs.250 and get 5% cashback on Central, Lifestyle & Shoppers Stop. Grab the given promo code to redeem this offer. Coupon code can be used once per user. Offer is valid till 31-12-2019. Choose from a range of best-selling Airtel prepaid recharge packs which provide you full talk time of Rs.120 when you recharge Rs.120. Offer is valid on selected numbers. Visit the store and get up to 150% off on recharges & bill payments. Offer is valid on minimum transaction of Rs.50. Minimum cashback of Rs.15 can be availed. Coupon code can be used once per user. Cashback will be credited within 24 hours after the successful transaction. Recharge now and avail Vodafone 121 offers for Vodafone prepaid subscribers. Offer is valid on credit, debit, net banking, FC Balance and UPI transactions. Grab the deal to redeem this offer. Recharge and get Rs.30 cashback on minimum Jio recharge of Rs.50. Coupon code is also available. Offer is valid only once per user/Credit/Debit Card, and Mobile number. Cashback will be credited to your FreeCharge Wallet. Freecharge is offering you flat 2% cashback on recharge and bill payments of Rs.50 or more. Get maximum cashback of Rs.10 per transaction. Offer is valid for once per user. Grab the coupon code to redeem this offer. Don’t miss this offer. Visit the store and enjoy 10% cashback on successful recharges and bill payments. Maximum cashback is Rs.10. Offer is valid for first transaction. Apply the coupon code at final payment. Enjoy the deal. Download the app from Google Play Store, see ads when you unlock your phone. Earn up to Rs.10 Aircel Top-Up per week. Also, get access to exciting deals. Mobile phones have become the vital and necessary part of our life and so is mobile recharge. With the changing world and advanced technology things have been to another level, now we are no more in the world where we have to stand in long queues or have to locate the specific retailer of different stores or different service providers to get our recharge done. Online world has made things easier which avail the seamless and quick facility to get your recharge done anytime and anywhere. There are number of online stores which provides you with easy recharge options and number of deals and offers available on your recharge options. As in today’s busy world, no one has time to visit these stores. In that case these online stores bring a smile on the user’s face. Now you no more need to feel irritated if you are out of balance midnight or while traveling. There is no such service provider who doesn't avail its customers with easy recharge options you will get recharge done of each and every operator at lower rates. How to recharge your mobile phones online? Enter your prepaid 10-digit mobile number on your choice online app/store. Choose the type of recharge whether it is internet package, cheap call rates or the calling recharge. Now pick recharge promotional codes of your choice and enjoy your saving while getting cash back or other offers. Now make your payments through Credit/ Debit Card, Net Banking or Paytm Wallet as per your choice, all your payment modes are secure, protected and reliable. Choose your mobile operator and amount of recharge. Check the availability of coupon on same recharge options. Now apply the code at the time of check out. Now check out and make your payments.